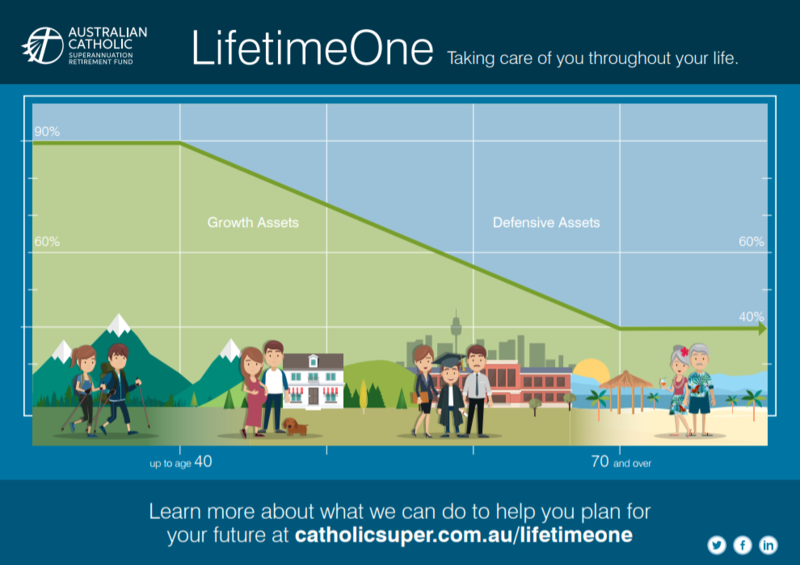 LifetimeOne is a great option for anyone who wants a superannuation account that automatically adjusts your investment mix based on your age. This provides you with a diverse mixture of investments that will help you grow your retirement savings without requiring you to make changes yourself. We’re proud to introduce LifetimeOne, our default investment option that changes your investment mix as you age and you get closer to retirement. What is LifetimeOne and how does it work? Until age 40, you will be in a growth-focused mixture with 89% of your investments in things like Australian and international shares. Each year after age 40, your investments will gradually become more conservative to protect your accumulated wealth. This will happen automatically on or about your birthday. We believe that by making small changes each year rather than big changes every say 10 years, LifetimeOne will provide you with a smooth transition between investment strategies. Like most other funds, we offered members who made no investment choices a single investment option – MySuper Balanced. MySuper Balanced was a well-diversified option that had a blend of growth and defensive assets. LifetimeOne though has 31 stages, as opposed to less than five, that will provide automatic and gradual changes to your investment mix as you age. LifetimeOne recognised at the Chant West 2018 Super awards! We have been recognised for our innovative new default investment option – LifetimeOne – at the Chant West 2018 Super Awards! Our CEO and CIO talk more about the awards night. Leave your details with us and we can arrange a time to discuss how we can help you further.